Photo by Desiree Miller, Family Fun Mom. Young swimmers head out into the ocean. It’s a concern year-round, but the risk of drowning incidents goes way up during certain times of year, like spring break and all of summer, and it’s not just little children at risk. Water Safety: Who’s at Risk? Photo by Desiree Miller, Family Fun Mom. Swimmers wait poolside for their chance to take a dip. Research by the United States Swim School Association shows between Memorial Day and Labor Day in 2014 there were at least 511 media reported drowning incidents involving a child under the age of 18 in the United States. Teens aged 13-18 were one of the highest-risk groups. They accounted for about 27% of the reported incidents. Seems surprising, doesn’t it? Since summer vacation is often the first chance kids and teens have to get in the water, chances are they haven’t been swimming since the summer before. 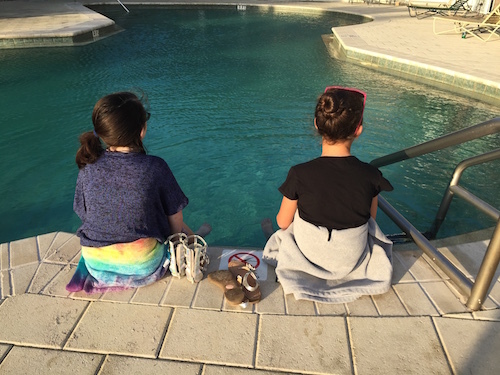 It’s critical that parents make sure even older children are taught water safety before they hit the beach or put their toe into a hotel pool, even the indoor ones, especially while on a trip away from home. The power of currents and rip tides are essential lessons to learn. It’s also important to share basic pool safety tips about diving in (or not diving in, to be more specific). More tips are below, shared by Sue Mackie, Executive Director of United States Swim School Association. 1. Create a verbal cue that must be given by an adult before children can enter the pool. 2. Select a parent to be the designated “water watcher.” This adult should not be drinking alcohol while children are in or near water. 3. Don’t leave kids alone. Always go with children to the hotel pool. Do not let them swim unsupervised. Just because you are on vacation does not mean you are on vacation from being a responsible parent. Don’t allow children to go to the kiddie pool without adult supervision. Lounging in the adult pool while your kids are swimming alone is an accident waiting to happen. 4. Do not use water wings or pool floats as a substitution for supervision if your child is not a strong swimmer. 5. Take time to familiarize your children with the pool, such as where the shallow and deep ends are, where stairs to get in and out are located, where they can and cannot swim. 6. If visiting a beach destination, do not rely on lifeguards to constantly monitor your children. You cannot be sure how experienced a lifeguard is and should never assume. It might take a new guard time to notice an unsafe situation and you need to be ready to react first if your child needs help. 7. 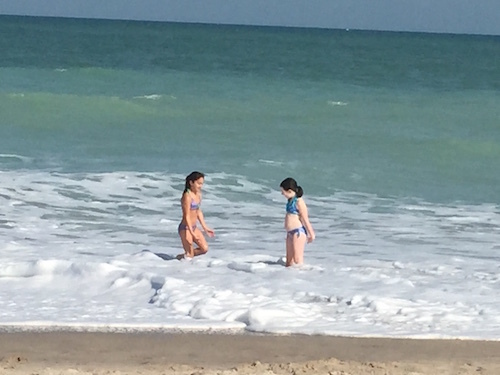 Before allowing children to wade into the ocean, explain to them that they need to constantly be watching for waves that could knock them over and other potential dangers. Parents should constantly be on the lookout as well. 8. If cousins and relatives are swimming together, gather the adults of your extended family and create an agreed upon set of pool rules before the kids are allowed into the water. It is also important for the adults of the group to meet and discuss each child’s skill level prior to allowing the kids into the water so everyone has the same expectations of what is normal or an emergency. 9. If you have a pool at home be sure to take precautions before traveling. Secure fences, gates, door locks and covers so an accident does not occur while you are away. To find a USSSA affiliated swim school near you, or for details on becoming a member of the nation’s leading swim school organization visit: United States Swim School Association. No one wants to deal with an emergency on vacation! Read these related articles for more tips on water safety. Teach your kids to swim before a family beach vacation. Expert shares waterpark safety tips for parents.